Whenever a family was going through a crisis in my small, Mississippi hometown, be it a death or a serious illness, friends and relatives showed up in droves to bring food. You could rest assured that affixed to the bottom of each container that arrived would be a strip of masking tape containing the name of the person who prepared the dish. Every soul who so generously shared food with the family knew that the piece of tape guaranteed that their dish would be returned. Almost without fail, some skilled southern cook would arrive with a pot of freshly-made chicken and dumplings. The few times that our family was the recipient of such generosity from the townspeople, the chicken and dumplings always got my attention. 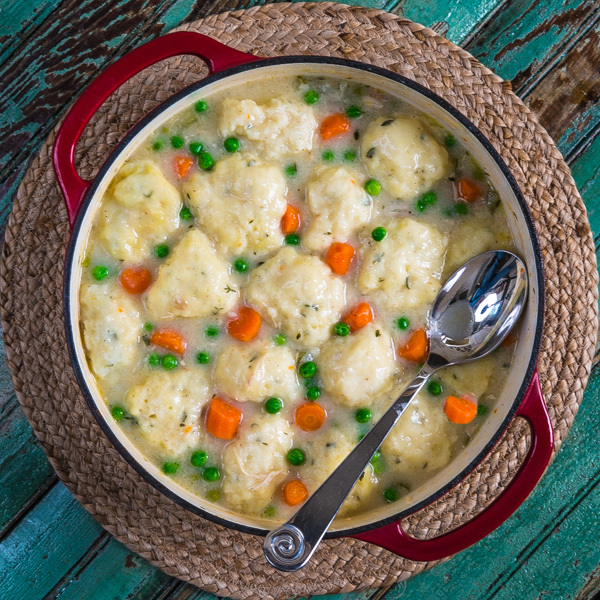 My Mom prepared chicken and dumplings somewhat regularly and whenever they made an appearance on our dinner table, I was a happy boy! Mrs. King, the mother of my neighborhood best friends and one of the most accomplished southern cooks I knew, made chicken and dumplings that were legendary. However, her technique for making them was different than most. I think of the classic dumpling preparation starting with something similar to biscuit dough made with flour, butter or shortening, and buttermilk. A stewed chicken provides the stock and the dough, rolled out and cut into pieces, simmers in the stock until tender. However, Mrs. King’s version contained egg and the resulting dumplings more resembled thick pasta. Her peppery version of this classic dish rivaled any that I’ve had. As southern cuisine has become more in vogue and dumplings more ubiquitous, I frequently see recipes for drop versions of this stew. By drop version, I’m referring to the technique of dropping large spoonfuls of a slightly sticky dough directly on top of the simmering liquid. In a previous post, I made a classic Mississippi version of chicken and dumplings where I rolled out the dough and cut it into small pieces. I then submerged the dough pieces into the stock where they cooked until tender. However, for this post, I wanted to try a drop version with a twist. I’ve always considered chicken and sage to be a perfect combination of flavors, so dumplings with sage was a no-brainer. Adding a little Parmesan cheese couldn’t hurt, right? The result was sensational. I like to leave the vegetables in bigger pieces while cooking with the chicken. If they’re too small prior to cooking they tend to disintegrate. I cut them into bite-sized pieces after the chicken is done. The base of this soup is chicken stock. As the dumpling cook, you’ll need a thickener for the broth. I’ve started using Beurre manié (French for “kneaded butter”) as a thickener for soups and stews. It’s a fancy name for flour that’s been incorporated into butter. The advantage to using this method is that the flour doesn’t clump in your soup. I use my fingers to blend the flour and butter together. It takes minutes and it’s a quick and easy way to thicken your soup. 1. Heat water in a large stock pot or Dutch oven over medium high heat. Add carrots, celery, onion, garlic, bay leaf, salt, and whole chicken. Bring to boil, reduce heat, cover, and simmer for 1 hour and 15 minutes. 2. Remove chicken from pot and cool. Debone chicken and tear into bite-sized pieces. Skim excess fat off the surface of the stock with a large spoon. 3. Remove vegetables and roughly chop. Transfer chicken and vegetables to pot and heat to simmer. Continue simmering for 15 minutes, uncovered. 4. Combine flour and butter, beginning with a fork and then with fingers until it resembles a smooth dough. Add butter and flour mixture to pot and stir until melted. Add thyme leaves and pepper. Adjust salt as needed. Simmer until liquid begins to thicken. Add peas just before topping with dumplings. 1. Add flour, baking powder, and salt to the bowl of a food processor. Pulse to combine. Add butter and pulse until mixture resembles course meal. 2. Transfer mixture to a medium mixing bowl. Add buttermilk, sage, and cheese and stir to combine. Dough should be fairly wet and sticky. 3. Using an ice cream scoop or a large tablespoon, drop golf ball sized dumplings into the simmering liquid. Cover and continue cooking for 15 minutes or until dumplings appear dry on top. Serve immediately. I’ve been making chicken and dumpling like this for years. I always use White Lilly flour and Parmesan cheese. I kneed the dough a little extra to keep the dumplings from melting away in the soup. Love seeing an old favorite on Pinterest! This was my first attempt at homemade chicken & dumplings because the only recipes I could find contained bisquick. Yuck! Thanks for sharing. It turned out delicious! Perfect on a cold, rainy night! Thanks so much, Susan. I’m so glad you enjoyed the recipe and I really appreciate you leaving your feedback. Hope you’ll come back soon! I have never made chicken and dumplings, but have wanted to for a long time. Bill your dish looks like pure perfection. Thanks for sharing. Oh Bill, I haven’t had chicken and dumpling since I left Louisiana almost 38 years ago now. Your pictures are bringing back so many fond memories and flavors. Of course my mother’s was never as beautiful as yours which is just over the top gorgeous! After going through your recipe I know that it is as delicious as it looks! Thanks for the memories! Seriously, I have never made dumplings nor have I ever had chicken and dumplings and I have lived in the south for more than half my life – gah – that needs to change! …checking airline fares from Monterey, CA to Georgia right now. I’d love to have you make this for me. The addition of sage is brilliant! Great photo! And wonderful recipe. I love chicken and dumplings. I usually do the more traditional dumplings, but sometimes do the drop dumplings too (and always use egg). Some day I need to do a taste-off between the two versions! Really good stuff — thanks. I usually make the traditional dumplings as well, but it was fun making these. I have to say they are much easier than rolling out the dough and cutting into pieces. Thanks for the comment, John! Wow, does this ever look Delicious! I’m drooling over your gorgeous pics=) I’ll be making this real soon; thanks for sharing! Was wondering if you cook the chicken whole, or in pieces? Skin on? Hi Elizabeth, thanks so much for visiting SBD. I cook the chicken whole with skin on. When I remove the chicken and vegetables from the stock, I skim any excess fat off the surface with a large spoon. Hope you enjoy the recipe. Let me know how it turns out. I too grew up eating chicken and dumplings.Of course nobody made them as good as my mother. After I was grown with a family of” my own I was laid up recouperating from a surgery and a neighbor showed up with a big dish of chicken and dumplings. I love living in the south! You’ve made me need to make them again. Thanks for a great recipe. Thanks for dropping by, Kathy. I appreciate the comment! You won’t believe this but I have never made dumplings before. This looks so comforting. I seriously may need to try this! This looks so hearty and delicious. Real comfort food! Can’t wait to try it! Thank you, Kim! I appreciate the compliment!